Easy for both you and your customers. Follow these 3 steps and let customers know they can buy with confidence without the worry of costly returns. Use our promotional banners on your site so PayPal customers know they can enjoy Return Shipping on Us when they buy from you. Just add a short line of code to the website pages where you want a promotional banner to appear. Tell your customers about Return Shipping on Us to prompt them to shop again on your site. Spread the news on your social networks to bring new PayPal customers your way. Over 6 million PayPal customers globally have activated Return Shipping on Us, so start measuring sales impact from day 1. Our research from businesses in 46 countries that already offer Return Shipping on Us shows very low return rates yet purchase transactions increased by around 3% overall. 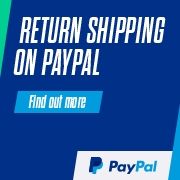 "We are really happy with PayPal's Return Shipping on Us service and it is a great benefit to be able to offer this to customers"
Your PayPal customers from 46 countries can also activate the Return Shipping on Us service on eligible PayPal purchases. Our banners automatically appear in the right language for them. We designed Return Shipping on Us to be straightforward for your business. There's no need to alter your returns policy. We reimburse your customer's return shipping cost. See FAQs below for terms and conditions. Yes. We have developed hosted banners in 10 languages and 6 sizes to help you promote the service to your customers. Select your preferred size, and place the source codes into your site (homepage, product pages and/or at the checkout). Can all of my customers benefit from this service? For UK businesses this service is available to customers who have opted into the service and reside in one of the following countries: Australia, Austria, Belgium, Brazil, Bulgaria, Canada, China, Croatia, Cyprus, Czech Republic, Denmark, Estonia, Finland, France, Greece, Hong Kong, Hungary, India, Ireland, Israel, Italy, Latvia, Lithuania, Malaysia, Malta, Norway, Netherlands, Poland, Portugal, Romania, Russia, Singapore, Slovakia, Slovenia, South Africa, Spain, Sweden, Switzerland, Taiwan, USA and UK. No. You should keep your return policy as it is. If you already offer free returns, the buyer can't be refunded as you've already paid for the return. Does it cost me anything to provide this service to my customers? No. There are no fees attached to this service, for you or your customers. Buyers simply pay for return shipping and request reimbursement from PayPal. To ask for a refund, buyers will log into their PayPal account, select the transaction, and click the ‘Request return shipping refund’ link enabling them to fill out a refund request and provide their posting receipts to the PayPal Return Shipping on Us service. They have 30 days from the date the return is sent back to the seller to request a refund. If their request is accepted, they will receive the corresponding funds directly into their PayPal account. It can take up to 10 days from the time the buyer submits the refund request form for a refund to go through. Can I, as a business/merchant, also ask for money back for my return costs? * Exclusions apply. This service is offered by PayPal Pte. Ltd in partnership with CallPoint New Europe JSC (TELUS International Europe), the service processor. This is an exclusive offer offered to eligible PayPal account holders. See full terms and conditions. ** Source: Compete.com, "Can shipping costs affect online sales?" *** Source: IPSOS Cross-Border Consumer Research 2015: "40% of consumers cite the cost and complexity of return shipping as a barrier to shopping internationally."